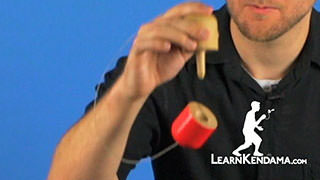 Learn how to string the Pill. 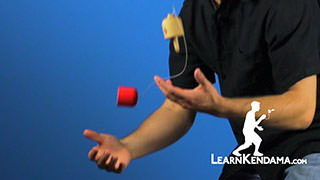 How To String A Pill Kendama TrickIn this video, I am going to teach you how to restring your Pill. You will want to restring your pill just for a variety of reasons. Maybe you want a different color string on it, maybe your string broke or it has gotten dirty. Maybe you want to adjust the length of the string. All of those are great reasons to restring it. It is pretty easy to do. What you are going to want to do first is get your pill and take the string off of it. You can cut the string off the node and cut it out of the cap. You will find that your cap has a bead inside of it. You will want to hang on to that bead. Your spare string should come with a bead but it is always great to keep a hold of it and have an extra one just in case you lost a bead, which happens sometimes. 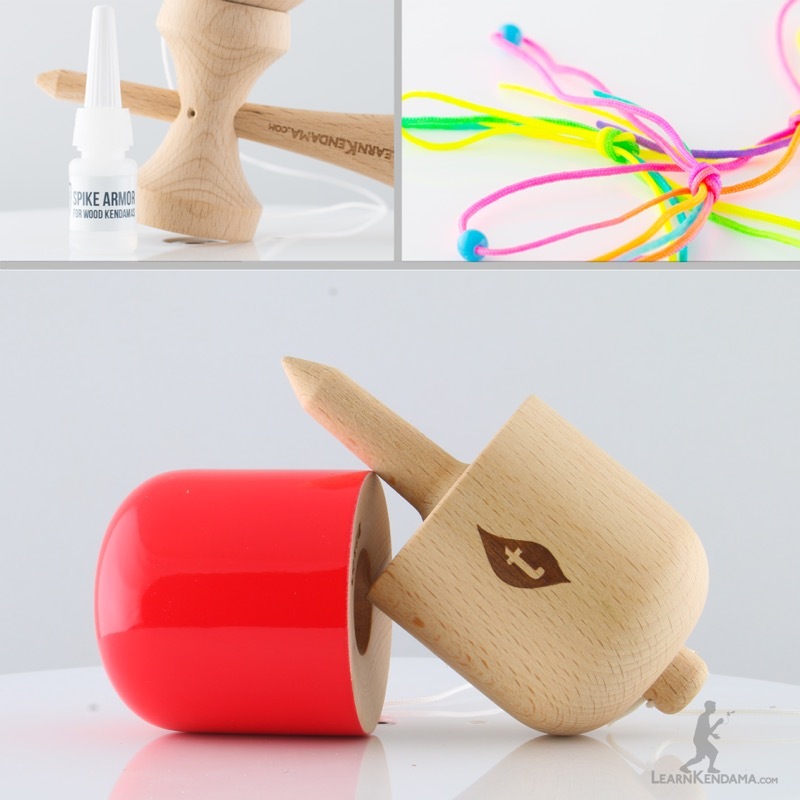 All you are going to need is your pill, your extra string, your bead, a pair of scissors that we will use at the end, and if you are having trouble getting the string through the holes, a flosser from a kendama is helpful. I find that the holes on the pill are very easy to thread the string. So that should not be a problem. To start off, what we are going to do is we are going to start by stringing the cap. So we will set the base aside and get the cap set up here. We will get our spare string. Typically, you want your spare string to be somewhere between 15 and 17 inches long when you start stringing. Then as you adjust it from there, it will get to the right length. 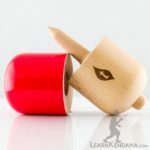 If you do not have a spare pill string and you are using a spare kendama string, that is ok too, it will be a little bit longer. You will find it will not affect it because we can adjust that length at the very end. 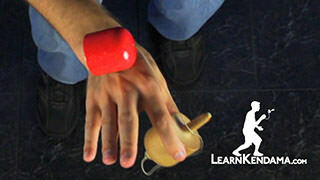 I will show you how to do that. To start, what we are going to do is take our string and we are going to thread it through the top of the pill cap like so. Stick it right through there. It is going to come out through the hole underneath so you can pull that through. You want to leave some string just to make sure it does not pull all the way through. The next thing that we are going to do is string our bead. So you can see the bead has a little tiny hole it in. I am going to stick this string right through the bead. You can actually drop that bead and let it fall right into the hole of the cap. When you tie this knot, what we recommend tying is a slipknot. That is for a variety of reasons. 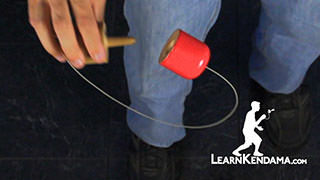 One is that the knot is thick enough that the string will not pull through the hole during play. It is also a helpful knot that it is easy to undo so if you want to adjust the length of the string or fix something, it easily comes out. You can use a regular double knot, that tends to be thick enough. But again, it is not so easy to untie that knot. So to tie your slipknot, what you are going to do is you are going to first start by folding the string in half like this. I recommend as you are doing this that you keep everything as close to the free end here as possible. I am going to make everything a little bit bigger just for demonstration purposes, so it is easy to see. 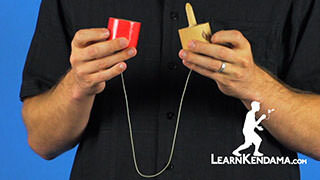 So you folded that string in half and I like to tell people to pretend that this is one string now. It is not a loop, it is a single string. What we are going to do over here is on this end that goes to the cap, we are going to form a loop. What we have now is our loop and then our folded string. Just like so. You can see there is this loop like this. 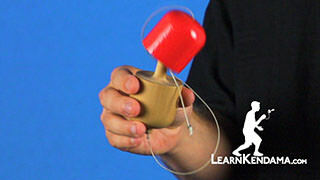 What we are going to do is take the folded string and stick it through the loop just like that. But you do not want to go all the way through, you want to just stick it halfway through. 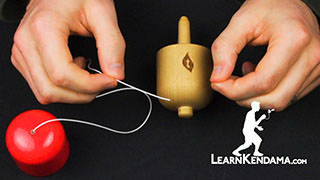 Then what happens is when you pull this string and tighten it around, that double string of string, you will find that you can tighten it and it creates a knot like so. Then you see here there is this loop and if I pull on the free end of the string, I can actually adjust the size of that loop. That is what is helpful, if you pull that all the way out it will actually undo the knot completely, which you do not want to do, but you do want to try to make that loop pretty small like that. That way it does not interfere with play. From here you can take the end coming out of the top of the cap. 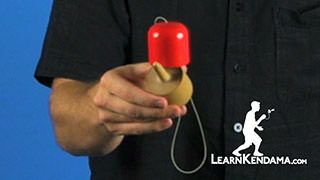 Pull it so that the knot goes all the way inside the cap just like that. Then go ahead and set your cap aside. We are going to tie the knot on the base. Now this knot we are going to tie on the base is called a bowline knot. It is a little bit complicated so we will break it down. It is a great knot because it is not a slipknot and it actually tightens as you play, so it kind of guarantees that the knot will not come undone, so it will last a long time. That is very helpful. What we are going to do is first start by threading the string through the hole on the node. Push that through just like that. And again, you are going to want to tie the knot as close to the free end as possible the whole time, but I am going to make everything really big again just so that you can see how everything looks. To start, we have this string coming from the base to the cap. We are going to make a loop with that. We are going to form a loop. You can see when I have formed my loop, that I have specifically made the string coming from the base out of the node here is on top like this. If you put it on the bottom, it will make it so the way we tie the knot will not actually work, it will kind of come undone or be really messy. So you want to make sure that the string coming out is on top. Then from here we have this free end, also coming out of the other side of the node. What we are going to do is come underneath this loop and thread it through. So you are not going to want to come over top, you actually want to come from underneath, through the loop with that free end. That gives us this formation here. We have got the string coming through, we have got the free end here, and we still have this string coming and connecting to the cap. Then next part we are going to do is we are going to take this free end here and we are going to go underneath behind this string that is coming to the cap. You can kind of fold it over and underneath like that. You can see how it comes out. It is coming underneath. We still have the hole that came through here. What we are actually going to do now is we are going to take the free end of the string and fold it over and stick it back through that same hole. I will show you that. So we fold it around the string and we have got the same hole. If I lift that up, you can see that I thread the string through that same hole again. So we have actually gone through that hole twice. From here, you can see we have got the string coming out of the cap leaves that to help pull tight. We have also got this free end of the string. There is another string here that is it parallel to. You pull tight, you actually want to hold both of those and pull tight. You might find your loop is really big around the node. So you may need to adjust it. To do that, you kind of have to pull just this string here. Kind of create some length and then pull the string here to tighten it up. It takes a little bit of work to kind of get the string close to the node. But if you work at it, it will do it. What you are going to find here is once the knot is finished, it is tied all the way. You get it nice and tight. There is still as you can see, a little bit of space between where my knot is and where the node is. 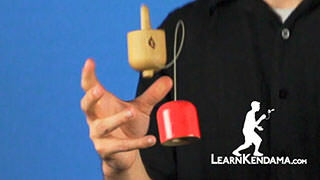 That is so that the string can move freely on the node. 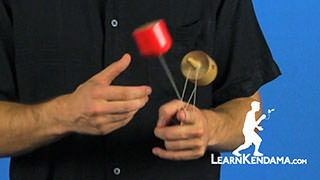 If you tie it too tight so that it is tight against the node, it will interfere with play and the tension of the string. So you do want just a little bit of space there. Just like that. You will see there is a little extra tail there. I will show you how to trim that in a minute. So once you have done that, you might want to play around with your pill a little, make sure the string is the length that you would like. If you need to adjust the length, you will leave the bowline knot right in place. You are actually, if you want to make it longer or shorter, the way to do it is to undo this slipknot and retie that. Once you have gotten it to the length that you want and you are satisfied with it, what you can do is trim off these little ends so a lot of times the end on the bowline knot, if it is short does not really matter much, but I still like to trim it, just a little bit, like that. 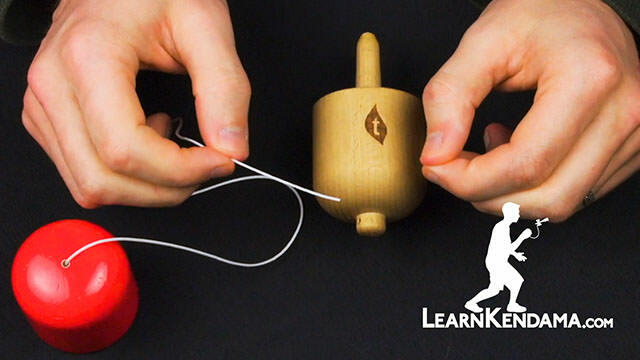 Particularly the one that you need to trim is if your slipknot has a longer end of string, which particularly if you are using a kendama string, you will find this is a little bit long when you are adjusting the length. You will want to trim that, but not too close to the knot, just in case you need to be able to undo that slipknot for whatever reason. You want to leave at least a little bit of a tail off like that. Once you have done that, that everything that you need to string your Pill.